Kills fleas for up to eight weeks in dogs and provides up to four weeks tick control. Contains fipronil. Small Dog - 2-10kg (3 pipettes). Is your pet scratching? Can you see tiny dark specks in his/her fur or small insects scurrying about? Do you have any unaccounted for insect bites? Sometimes your pet may be infested with fleas but show no signs. Fleas can cause major health problems for cats and dogs including flea allergy dermatitis - a serious skin allergy causing hair loss, sore skin and itching - and anaemia in kittens and puppies. Fleas and ticks can be a problem even in the cleanest home or on the cleanest pet. Treat you pet and your home to keep fleas away. 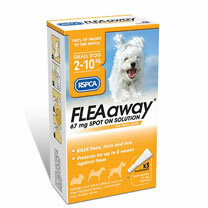 Applied monthly to cats and dogs FLEAaway™ can help provide effective control against fleas and ticks all year round. Kills fleas for up to eight weeks in dogs and provides up to four weeks tick control. Comes in an easy to use pipette. Use medicines responsibly and ask your vet or visit www.rspca.org.uk for additional advice on how to treat your pet and your home. Please always carefully read all packaging and information included with RSPCA FLEAaway™. Each pack will indicate what weight of cat or dog it is suitable for. Please weigh your pet before using RSPCA FLEAaway™. 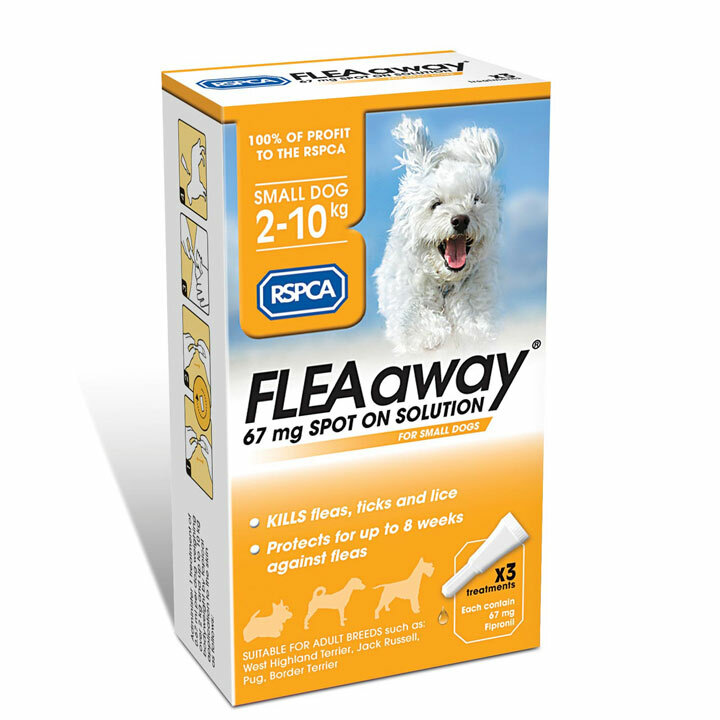 RSPCA FLEAaway™ Spot on Solution is specifically developed for use on dogs and should not be used on cats or rabbits. RSPCA FLEAaway™ is not suitable for use on puppies less than 2 months old or weighing less than 2kg. Do not use on sick or convalescent animals and do not use if your pet has a hypersensitivity to fipronil or the other ingredients. If you have any questions or concerns please speak to your veterinary surgeon for tailored advice. If you have concerns or any form of complaint regarding FLEAaway please email productsupport@rspca-services.org.uk .